The spur from the Pennsylvania Railroad to The Upjohn Company manufacturing complex in Portage was installed early in the construction of the site in the late 1940s. The spur divided into four tracks, all of which remain today. 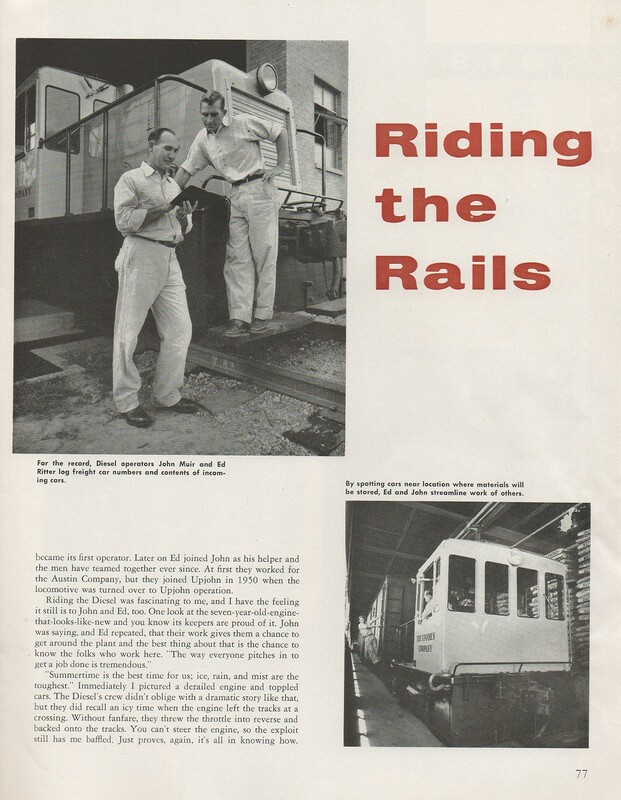 The facilities were designed around the railroad spurs as shown below. 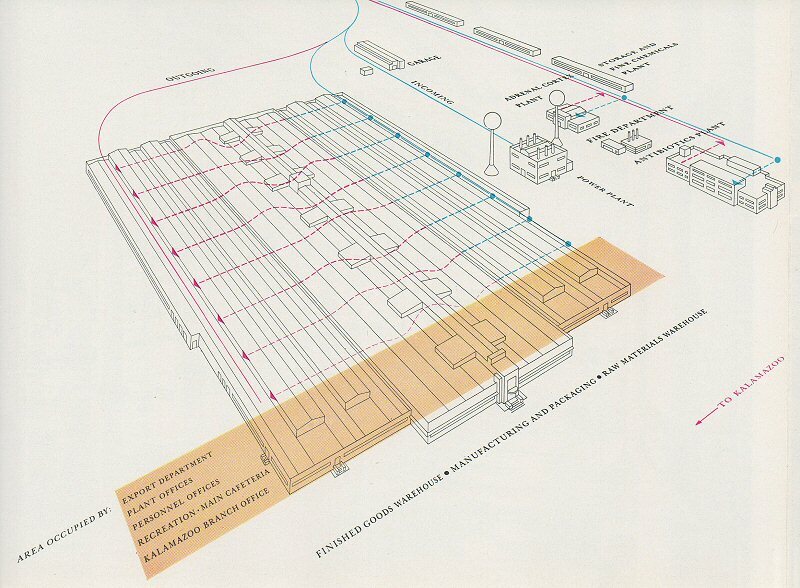 Incoming materials (blue line below) into the main manufacturing building (Building 41) moved across it and exited as product on the outgoing rail spur (red line below). Most of the construction materials and steelwork were brought in by railroad. 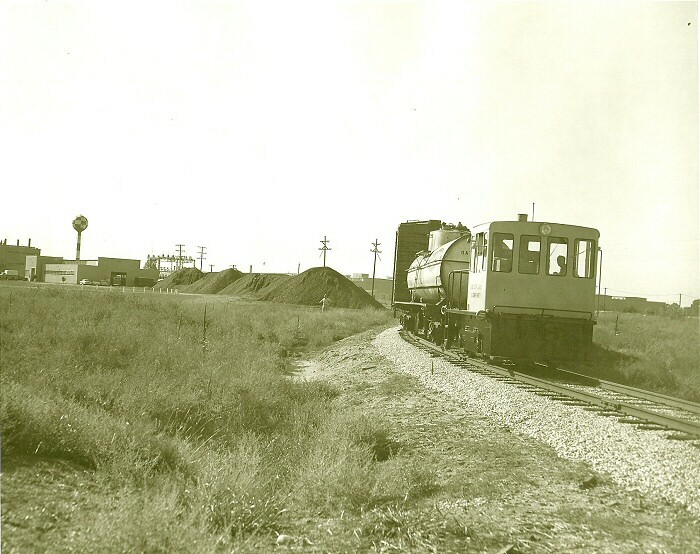 From movies taken of the construction, it appears that the first Upjohn switcher, a GE 25-ton unit, did not show up on site until the initial construction was well under way. Before then, cars were moved around by a bulldozer so construction materials could be unloaded at the right place. 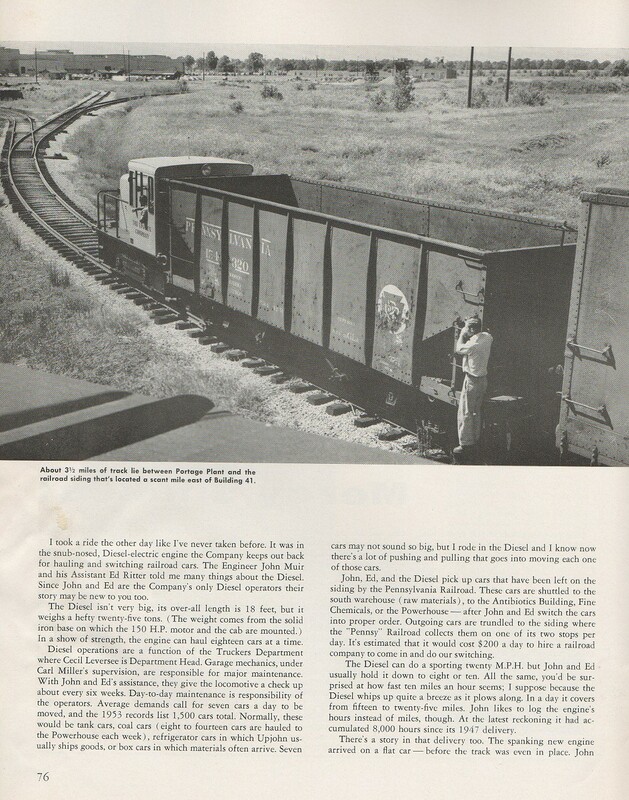 Click on the photo below to see a video from when that first switcher arrived. It will stream to you in Windows Media format and play on your Windows Media Player. There is no sound with it. Here is a photo by Lance Ferraro, likely taken in the early years of operation at the site. The garage and power plant are in the background. 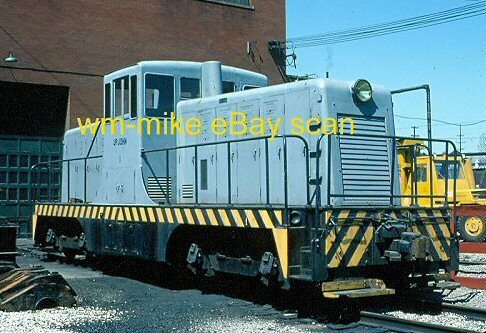 And here is a photo of that original switcher some 25 years later in the summer of 1976. At the start of manufacturing, 91% of inbound shipping, not including coal, was by rail. This means that practically everything came in by rail. Boxcars and TOFC were used to send out Upjohn finished products to five distribution centers - New York, Dallas, Los Angeles, San Francisco and Portland. However, in 1973 trucking took over all ground shipping to the distribution centers. The rail spur continued to handle inbound materials, solvents and coal. By 1984 the percentage of inbound shipping delivered by rail was still 75% when including coal. The amount of coal delivered at that time was 165,000 tons a year. It was stockpiled at the rear of the facility and taken to the power-house every day using a small fleet of Upjohn-owned open hoppers. The date and location of the photo below are unknown. 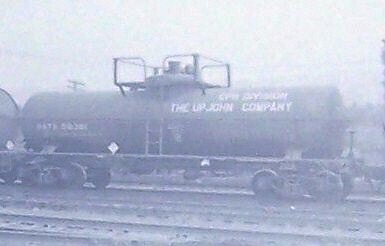 The Upjohn CPR Division was the plastics operation, which was mostly in Texas, so it's unlikely this tank car ever made it to Kalamazoo in revenue service. 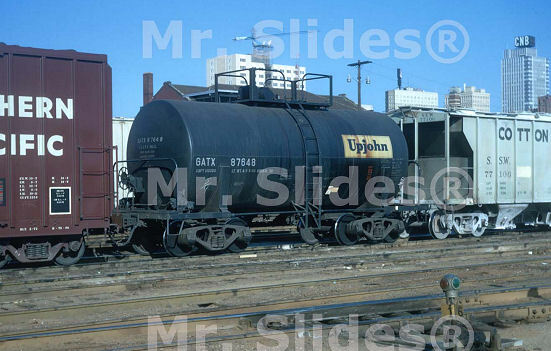 In a slide I unsuccessfully bid on, here's a short GATX tank car on lease to Upjohn, shown in Forth Worth, 1972. 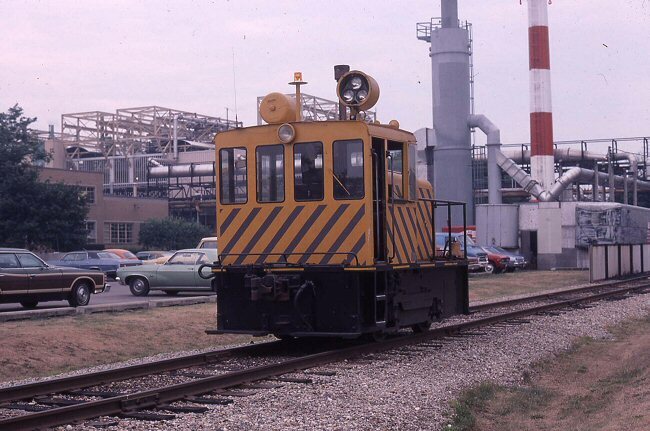 The GE 24-ton switcher was replaced in the late 1970's by a GE 44-ton unit. This unit was originally bought and used by the U.S. Navy. 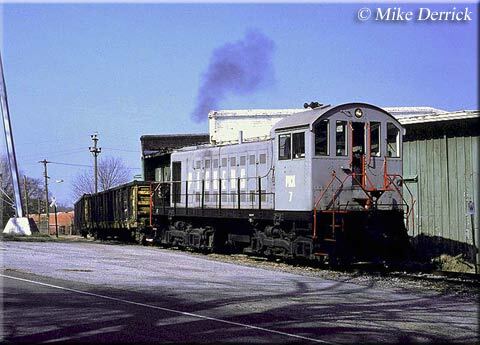 Here it is in Youngstown, Ohio in April 1977, prior to transfer to Kalamazoo. This is a another slide I unsuccessfully bid on. The original G.E. locomotive was stored in a warehouse bay within the Portage site for many years, finally being transferred to a Monsanto facility in Missouri in the late 1990's. 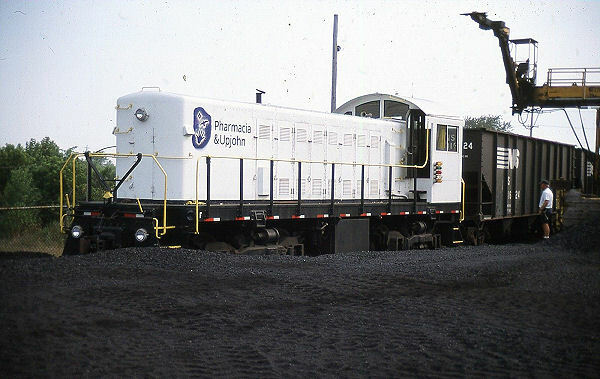 Pharmacia & Upjohn replaced the 44-tonner with a larger Alco S2 locomotive that is remote controlled. I found a notation that this Alco used to be #7 on the Pickens Railroad, a shortline in South Carolina. Here is an undated Mike Derrick photo of it in Anderson, South Carolina. 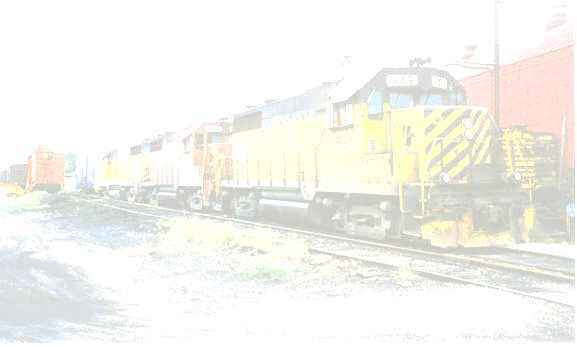 After repainting, here it is in 2001 at the coal pile behind the Portage complex. In 2015 the site is owned by Pfizer. Norfolk Southern (NS) delivers coal and tank cars of solvents via the spur. In summer 2015 there was a new boiler delivered on a special flat car. Here is some video of the Grand Elk Special with the boiler at Schoolcraft. Switching occurs daily. Pfizer replaced the engine and drive motors so it is in good shape. The old GR&I/Pennsy line is lifted south of Pfizer so all rail traffic goes via Botsford Yard in Kalamazoo. 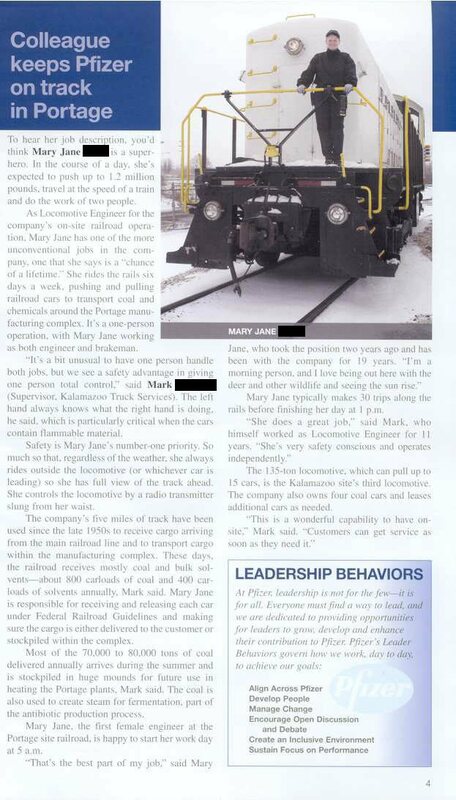 Here is an article from a 2007 internal employee newsletter describing the operation. 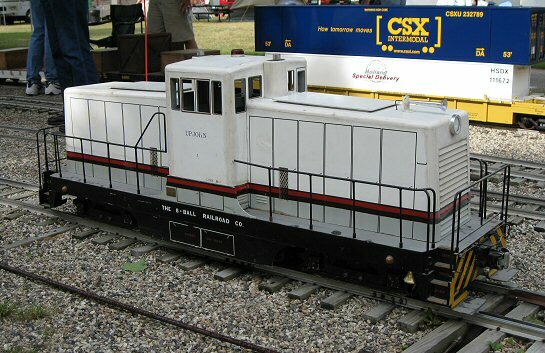 In July 2009 at the White Creek Railroad, a 7 and 1/2 inch gauge railroad in Cedar Springs, I ran across this working model of the Upjohn G.E. 44 tonner. 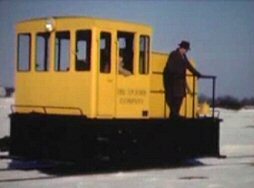 It was made by Tom Briggs around 1970, runs on 2 x 12V lead-acid batteries, is remote controlled and can pull several scale freight cars. You can see the current spur tracks by using the Birds Eye view at Microsoft Live search maps. For 65 years the spur has been used heavily and it continues to play a vital role in the manufacturing operation today. For photos of the Pfizer switcher in 2012 click here.